3 Wheel Aluminum Rollator Winnie Lite Supreme (Light Weight),7.5" caster wheels and ideal for indoor and outdoor use. Easy to maneuver through small places. Only 11 lbs and a very stable walker a feedback from one of our customers. A loop lock built with aluminium casting for easy operation and safety. 7.5" casters wheels having a very soft grip help in moving indoors and out doors. Standard pouch helps in groceries. I can highly recommend this walker as I am using it and I am very satisfied with this device. Quite helpful and supportive. 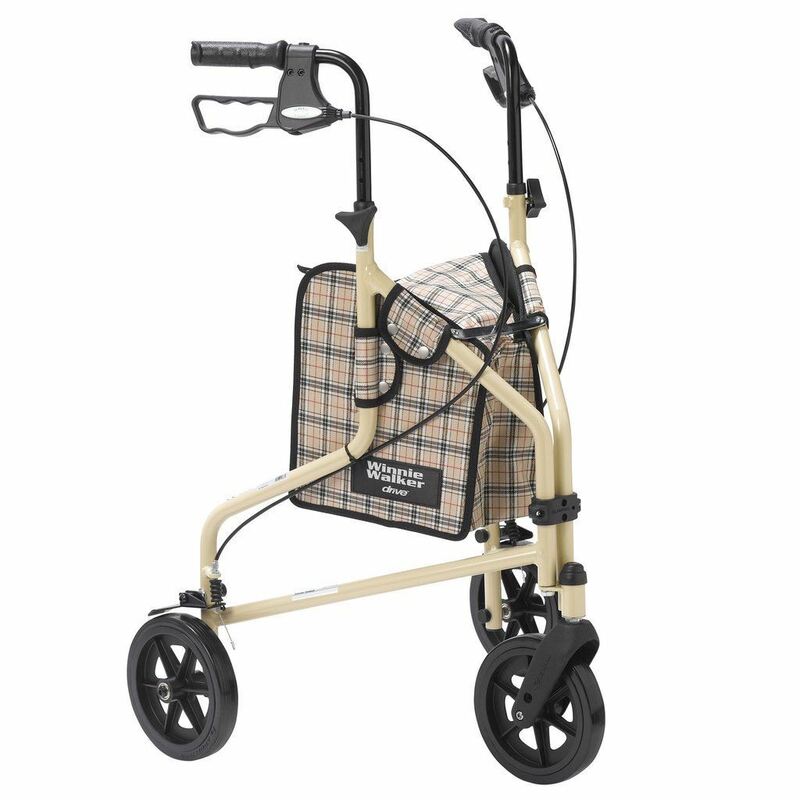 This is a stylish and lightweight walker with amazing features. I simply like its adjustable handles and brakes which makes this walker more comfortable to use. I love the carry pouch as it allows me to put my personal stuff in it while riding. It has an amazing loop lock system which makes it more secure and safe to drive. A simple,easy to use device with excellent features. I bought this walker for my mother. The one which she was using earlier was heavy but she loves this 3 wheel aluminum rollator. It is stable,lightweight and easy to fold. Much easier to use and carry. This is a light,sturdy and portable walker. I check in and take it to the plane and pick it up at arrival. I chair is waiting to go up tamp this is light and easy for me to put on my lap. Once luggge is picked up. I travel with one Eddie Bauer bag that fits between the handles an off I go. Really I have travelled over many terrains with a 30lb piece of luggage with little problem. Airport personall cab drivers and others have commented and complimented me on this walker. For the price and if you don't require a seat i strongly recommend this. I received my walker and immediately tried it. I was delighted – it handled well, it was sturdy and light. Getting it in and out of my car was simple The only problem I had was the very stiff brakes. After being told to spray a bit of WD40 in it we found that was all it needed. It works great – easy to handle, no tipping, narrows nicely to get through small spaces – just can’t say enough good about this walker. I take a lot of seniors to appointments and I myself am handicapped so this makes all of our lives so much easier. Thank you so much – it’s perfect.!!!! I was determined to buy this walker and the reviews added to my determination. I love my purchase. Before buying, i wanted to have a look at the product and get a feel of it and after chatting with Jane, she told me that I could go to their store and take a look. I stay close by so I went and checked this walker. It was as described and so easy and light weight. Handles are also height adjustable making it much more easy to control. This walker for sure is value for money! What a great website and awesome customer service! I am so happy that my product arrived well in time and in great condition. Definitely worth recommending! A great walker for this price. It is light weight and sturdy and can be easily folded. Easy to carry around. One of the best walkers' I have seen or tried so far. Extremely satisfied! This is a pretty light and stable walker. The adjustable handle height is another good feature. I simply love this walker and needless to say, the delivery was quick too. Since I stay in Vancouver, I received the walker the same day through their delivery guy which was simply amazing. received my insurance claim for it. The company is 100% genuine with great products and commendable service. Great site and prices. The products being offered are very well explained and priced perfectly as compared to other websites. Best is that you can find almost everything under this website that you need related to your health. I am still waiting for my rollator and I am very hopeful that the product will be as good and comfortable. This easily is one of the best 3 wheel rollator. Super light, sleek and comfortable which is very easy to move around in and out of the house. Fairly priced and easy to order. i just love my rollator. My shopping experience here was worthwhile and I am definitely going to shop again. 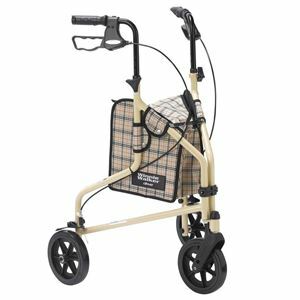 I love this walker which is why this is a second purchase of the same product for my husband. The site is very easy to use, the service is great and the staff is very polite and helpful. The only thing I was disappointed this time was that last time I ordered this walker, I got a free pouch with it and that offer is no longer there. I really liked it and wanted that free pouch with the walker. Otherwise, best walker in this range. I needed a 3 wheel walker and the lady on phone suggested this to me. I received it yesterday and I must say this indeed is a great 3 wheel walker. Lightweight, easy to use and manoeuvre. Will definitely recommend to anyone looking for a 3 wheel walker. Fast and efficient, loved the walker.